Punjab Heritage News. Daily news of Sikh and Punjabi heritage. 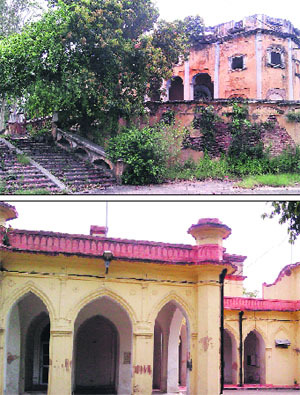 The heritage buildings in the district lying in a deplorable condition are likely to receive a face-lift soon as the Punjab Heritage and Tourism Board has decided to spend more than Rs 50 crore on the conservation and restoration of these buildings writes Arun Sharma in The Tribune. A proposal of Rs 50.73 crore had been prepared for such works at Jagatjit Palace, Gol Kothi, Baghi Khana, Civil Rest House, Kanjali wet land and parks and roads at Kapurthala and Sultanpur Lodhi. The renovated 16th century architecture of Rohtas Fort will give a boost to local and foreign tourism and promote the heritage of Muslim history. The Shiromani Gurdwara Parbandhak Committee (SGPC) has handed over the kar sewa (voluntary service) of cleaning discoloured and damaged gold plating of Golden Temple to Baba Kashmir Singh Bhuriwale. Earlier, for the last 14 years, the sewa was regularly being performed by Guru Nanak Nishkam Sewak Jatha, Birmingham, UK. The jatha had performed the kar sewa of regilding of gold plating of Golden Temple from 1995 to 1999. With the onslaught of weather, the gold plating had faded on various areas of dome and exterior as well as interior of the Golden Temple and these required continuous cleaning and repairs. “There are some black spots on the gold plating which need to be washed and for that we have given kar sewa to Baba Kashmir Singh Bhuriwale,” said secretary, Golden Temple, Roop Singh, while talking to TOI on Friday. Patiala: Showing serious concern over dilapidating condition of heritage monument Qila Mubarak of Patiala, a team of experts from the International Council on Monuments and Sites (ICMOS) has questioned Punjab government’s inability to protect forts. “Punjab has only a few forts, and Qila Mubarak is of utmost importance. The state must learn from Rajasthan which in the last 15 years has developed its forts and has managed to attract huge tourists from the across the globe. When Rajasthan can protect its sites, why can’t Punjab?” David Bassett, who led the three-member team, told HT. From Britain, Bassett is also a member of the International Fortress Council. Although 40 members of the ICMOS had originally come to Rajasthan to visit the forts in the state, some of them visited Patiala after an invitation by local NGO Patiala Our Pride and Malwinder Singh, a scion of the erstwhile royal family of Patiala.